Haven't tasted our candies before? 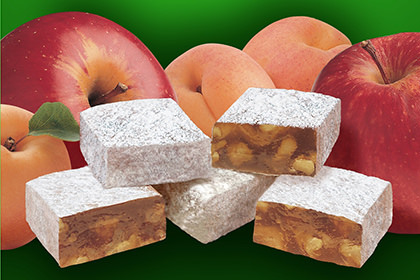 We'll send you a 4-piece package of our famous Aplets & Cotlets candies and a 4-piece package of Fruit Delights candies along with our current product catalog for just $2.95 and FREE SHIPPING! Just click ADD TO CART, give us your name, address, and payment information, and we'll send your samples right away via USPS First Class Mail (allow 1 to 3 weeks for delivery). Coupons not valid with this item. Limit: This special offer is for "First-Timers" only, and is limited to one sample shipment per customer. Available for U.S. shipments only. Awesome! Everybody's taste is different so I highly suggest trying this offer for first-time shoppers... we loved them so we are buying more (much more!). Can't wait to try other products! I absolutely love these candies. Nothing else measures up around the Holidays!! Received a box of candy. Put it into the cabinet and forgot it. When found, finished it in a few days. It was sooo good! Won't make that mistake again. My best friend, B.J. sent these to me as a gift for Christmas 2011...I must say, these were THE best Sweets I have EVER eaten..I like to think that in Texas we have the best of everything, but I have never heard of these...They are the best Sweets I have ever eaten.....I ABSOLUTELY love these Sweets...Many Thanks!!! 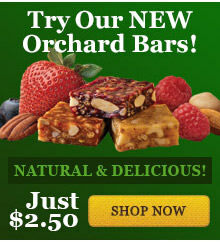 I ordered the candy trial offer, not the orchard bars. I don't want the bars, I wanted the aplets & cotlets. Can I return this with postage due to you and a full refund? Liberty Orchards reply: Sorry, Janet. Our customer service staff will be in touch with you to fix this. Thanks for letting us know. I love all Liberty Orchards candies.LOVE THEM, and was still blown away when I first tasted the bluberry-pomegranate bars. Fantastic! Thank you for these! Dec 5, 2010 | By Gayle A.
I've been eating Aplets & Cotlets for 41 years. They're one of a kind flavor that is excellent in taste. In fact all of Liberty Orchard's products are the same...meaning EXCELLENT! I love candy, it's my favorite food. I also love nuts. I found your candy in our local Dollar General Store around holiday time a few years ago. I buy it whenever it is available. Great job!